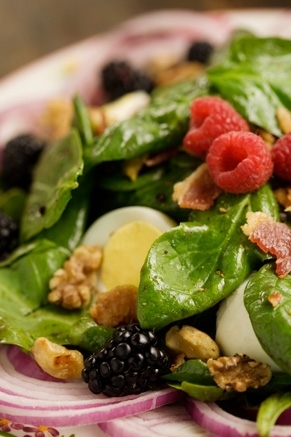 In a large bowl, gently toss spinach, onion and egg together. Keep refriigerated while preparing dressing. In a small saucepan over medium heat, combine reserved bacon fat and Paula Deen Collection Blackberry Walnut dressing. Heat through for 10 minutes. Pour hot dressing over spinach mixture. Garnish with walnuts and fresh berries. Serve immediately.